Thursday, August 3, 2017 – CU Denver Business student and RMI senior Janet Zamora-Ramirez met with Brian Snow, Managing Director, Mountain States Territory of AIG, to personally thank him for the $1,000 AIG scholarship Janet received in spring 2017. Brian also wanted to let Janet know how much he appreciated her hand-written thank you note for the scholarship. “I have it hanging in my office,” Brian said. AIG has been an early and strong partner to the CU Denver Risk Management and Insurance Program. 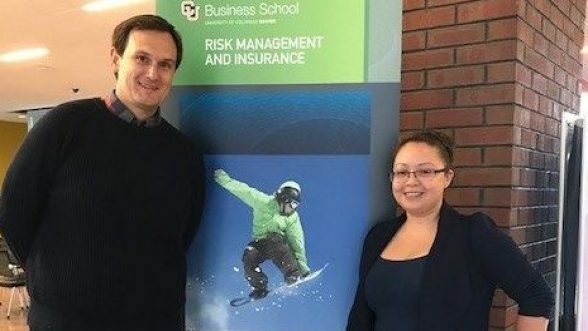 In fall 2014, AIG endowed a scholarship fund to encourage CU Denver students to enroll in RISK courses and major in RMI. The industry scholarships also encourage high academic achievement and program engagement by RMI students. In fall 2017, the RMI program will award more than $20,000 in scholarships to students enrolled in qualified RISK courses. RISK courses are still open for enrollment and the scholarship application deadline is August 25. “I greatly appreciate the AIG scholarship, as well as the PRIMA scholarship I received in 2016. RMI scholarships have enabled me to continue my studies, and I will graduate into an industry with a well-paying job that I love.” Janet accepted a full-time job with FCC Services after she completed her Risk Management internship with them. “So you’re already taken?” Brian asked of Janet. “I always keep my options open,” Janet replied with a smile. Janet has learned her RMI degree has enhanced her competitive value in the risk industry.